What do we drink when we're out on the town, when the night calls for a slinkier than usual dress and a swankier than usual cocktail? We always order a Sidecar, a classic made with Cognac, Cointreau and lemon juice, elegantly served in a martini glass with a sugared rim. Over the years, "I'll have a Sidecar" has become our shorthand for "It's a special night." So when we were looking for something new and festive to serve when our family gathered for Thanksgiving and Christmas, we began by tinkering with our old favorite, in part by substituting Calvados, a brandy distilled from apple cider, for the usual Cognac (distilled from grapes). The result is a riff on the Sidecar that's strong and smooth with the bracing sweet-tartiness of citrus juices and a hint of apple. In homage to its progenitor, we named our newest Signature Cocktail the Sidekick. We predict that "May I pour you a Sidekick?" 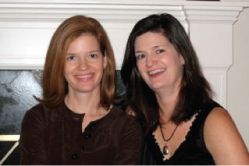 will soon become Purcell Sisters shorthand for "Happy holidays!" Wet the rims of two martini glasses with a lemon wedge and dip in sugar. Combine the cocktail ingredients in a shaker, add ice and shake 30 times. Strain into the sugar-rimmed glasses. 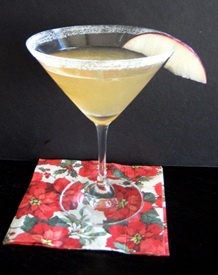 Garnish each with an apple slice if desired.